We work for the acceptance of the wolf by means of education and non-lethal conflictpreventing measures. We call ourselves VargiVäst because our workingarea is (south)west Sweden. 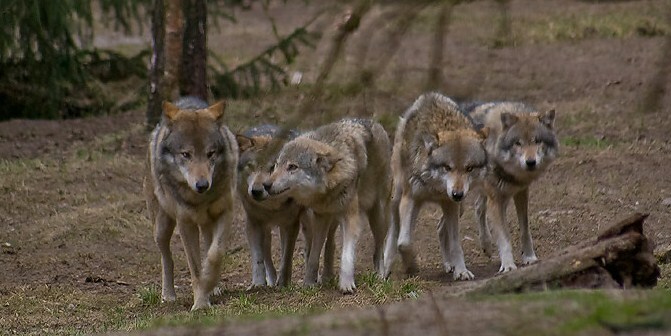 We follow the swedish predatorpolicy, especially the recent changes concerning wolfmanagement. Esther van Zon and Rick van Malssen are the forces behind VargiVäst. We both have been fascinated by nature and its processes since childhood, and we travelled the world to learn and enjoy this. We became fascinated by the strong emotions a species like the wolf inflicts on humans, both very positive or very negative. We got into this subject. We visited “international Wolfcenter” in Minnesota for some weeks and took courses on wolfpredation and wolves and the ecosystem. We studied “Wildlife Management” in the Netherlands. 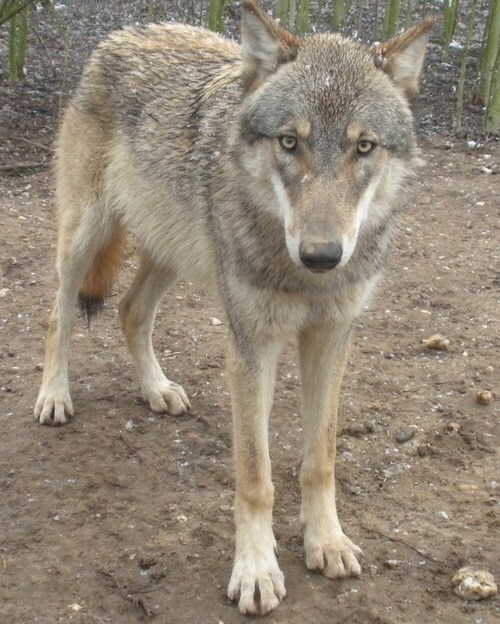 We worked as volunteers at Wolfpark in the USA, and studied wolfbehaviour there. We worked as assistants to a wolfbiologist in Poland, and learned how to “read” excrements and wolf-prey relations. We observed wild wolves in Yellowstone np and in Minnesota and took part in several national and international wolfseminars and –symposia in different countries. We are working as guides in wolftrackingholidays. With these activities we have build up an international network of researchers and otherwise engaged people in the natural sciences concerning wolves. We are fascinated by the swedish nature as one of the last “wildernessareas” in modern Europe and the comeback of the wolf and are following ocurring conflicts and solutions to these..
We think that wolves deserve their place in nature just as much as any other animal that belongs to the original fauna and want to increase peoples knowledge on the species and by this the acceptance of its existence. With our experience abroad and in Sweden we think the wolf can be able to play its roll in nature in coexistance with humans! Wolves are making a comeback in some areas in Europe, after years, sometimes centuries of absence. This doesn’t always go easy. Fairy tales, rumours and prejudism influence the image that some parts of the population have. These kind of images and some wolf-human conflicts block a smooth reintroduction and led to large eradicationcampagns earlier in history. That is why we think it eminent that those involved supplies objective information about wolfbehaviour and potential conflicts and how to solve them. Despite the fact that wolves have never been totally exterminated in Sweden fairy tales and rumours are vivid. Factual knowledge is limited. Besides, the hunterlobby and –organisations are very well developed and powerfull. They profide a large part of the total information and advice to the autorities as well as to the public. Biased information, a new government and some predatory conflicts finally resulted in the first licensed wolfhunt in modern time in Sweden in January 2010. The wolfpopulation of only about 220 animals is rather inbred because of the small genetic base of only three founders and the isolated geographic conditions of the scandinavian peninsula. We from VargiVäst don’t think hunting is a solution and want rather profide an objectiv informationflow towards the population and autorities to increase acceptance. This way a more peacefull coexistence between wolves and humans will be made possible. To actively try to increase acceptance for the natural dispersion and establishment of the wolf in Scandinavia by means of informationdevelopment and –exchange about the wolf, it’s dispersion and habits. Also we want to inform accurately about potential conflicts with humans and possible solutions. An article on Echinococcus, a caninerelated parasite, on the factspage of the Nordulv foundation. 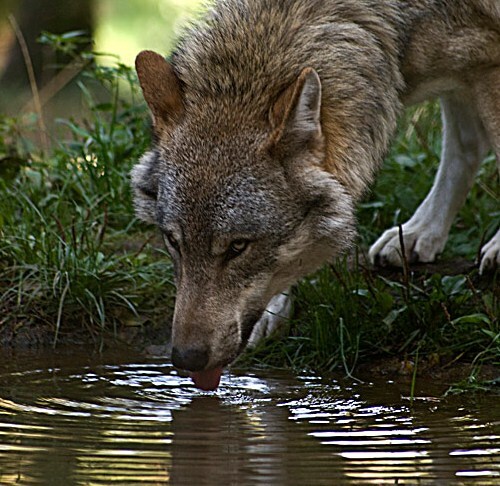 Objective information about wolves, ecosystem and social behaviour. Information about actual wolfrelated damage on dogs and lifestock in combination with non lethal methods of preventing them. To refer to autorities to get details about compensations and contributions for farmers and hunters. Fast respond to actual questions and conflicts. We react by informing the public in different ways, contacting our network and decide what steps we’ll make. With this we work closely together with the Swedish Predatorfoundation. -Reaction on a change of the predatormanagementplans 2009 (licensed wolfhunt) by the government. We studied the old and the new national wolfmanagementlegislation and advised other non profit organisations how to respond and appeal to the government and the European Union. The EU questioned the swedish wolfhunt and the dispute still goes on. -We organised an information/fieldtripweek for the dutch organisations Ark, Free Nature and Dutch Mammal society and visited autorities, private persons and organisations with them. 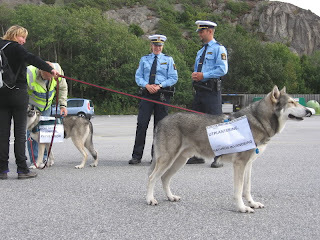 Among them Västra Götaland provinceboard, police specialised in illegal hunting, lifestockowners who experienced wolfattacks and lifestockowners who use special wolfdetering fences. In a specially trained team we work for voluntarily on building predatordetering fences for lifestockowners that have got permission and funds to build such a fencingsystem. Besides building fences we provide farmers with information about changes in legislation and indemnities and how and where to applie. We stimulate the attention for these services in the media. Unfortunately the government decided to decrease fundingpossibilities since januari 2010 for these fencingsystems, so from then on not the entire costs are refunded by the autorities. This resulted in a decrease in applications for these fences. We need sponsors to help compensate with the costs, so that more farmers will use these non lethal conflictavoiding methods. This would ofcourse benefit acceptation of wolves in these areas. 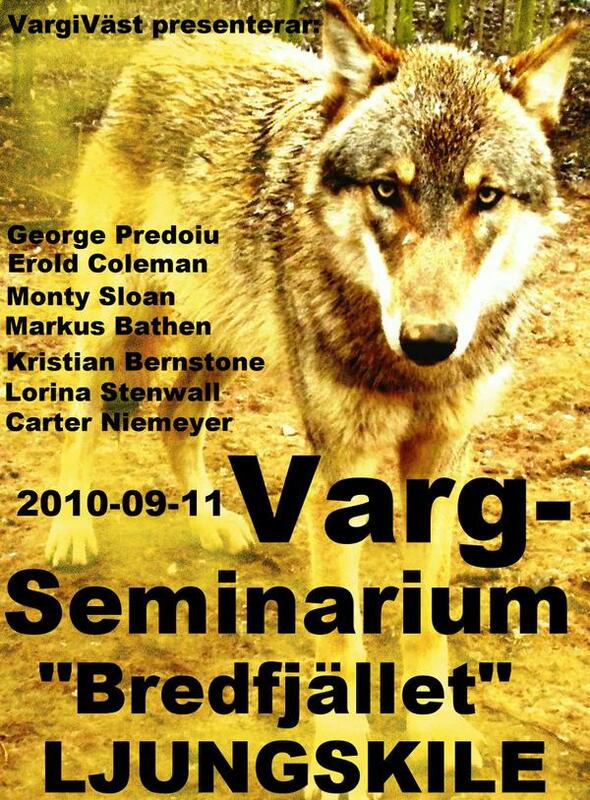 11th september 2010: we organised our first international wolfseminar to give the population the opportunity to obtain the latest information on wolfresearch and international differences in management in relation to wolves in the wild and in captivity. It was a big succes! The visitors were positively suprised by the high level of the presentations and the objectivity. In the future we want to organise more of these seminars. Also for this we could use some funding! We play an active roll in the Swedish Predatorfoundation. We initiate activities and gatherings. 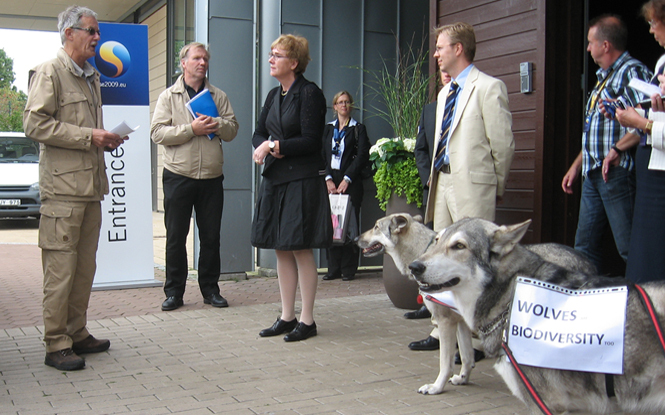 We gave rise to a sympathetic demonstration during an EU summit on Biodiversity in Strömstad in Sweden 2009. Signatures were handed over to the environmental ministeries secretary. Horse and carriage went in front of the procession, people and wolfdogs followed! The demonstration generated a lot of positiv publicity in national press. During our trackings in wolfterritories we collected wolfscat for determination and analyses in a researchproject of Grimsö, by Sabrina Muller. We are willing to cooperate in the future as well! We are cooperating with governmental Naturvårdsverket about the implementation of a new predatorinformationcenter in south Sweden. We are active in ecotourism with our wolftrackingholidays. All our activities and work at the moment are restricted by a limited budget. The more sponsors we get the more we can do to inform the swedish public about opportunities to live side by side with wolves with the least possible conflicts! This way we hope to obtain acceptance for the species and as a result a viable population which will be respected. At this moment the population is not only small but also weak because of inbreedingdeficiencies (bonedeformations, decreased fertility) and therefore barely viable. Any hunting is making this situation worse. Sweden is not only because of its low populationdensity very suited to have a viable wolfpopulation, also the presence of enormous quantities of preyspecies is beneficial! Different enquiries reveiled that the majority of the swedes turned out to be very positive towards wolves. Besides this the wolf has a very important ecological rol to play in a natural ecosystem. We think it is improtant to give the wolf a second chance and with some good will this will be possible! Do you support our view and want to help us, sponsor us! We think even more is necessary! That is why we developed a plan for a wolfinformationcenter in west Sweden. To try to increase acceptance for the wolf by means of decreasing conflicts and to initiate informationdevelopment and –accessability. We will initiate all possible relevant information and education to obtain this goal. The center will be founded in west Sweden in the Uddevalla-region, where the wolf is making a comeback from extinction. Focusgroups are all that live in or visit the region, especially children, juveniles, farmers, hunters and those living in or around wolfterritories in the area and all others that are interested. Roll of the wolf in the ecosystem. Generell and specific info abouton the influence on daily life. Potential conflicts and populair solutions. Generell information about the roll of wolves in the ecosystem. Specific information about the influence on daily life of children. Exhibition with interactive programs like video, educational computergames like “Wolf” and “Ranger” for more understanding of natuaral processes. Exhibition with fur, paws, prints, etc. Permanent picture/art exhibitions with nature subjects. Guesthouse for volunteers, seminarparticipants, wolftrackers etc. We plan to have “life”examples of several electrical fences, sheepenclosures, huntingdogprotectionvests. -Implementation of education to build wolfdeterring fences. 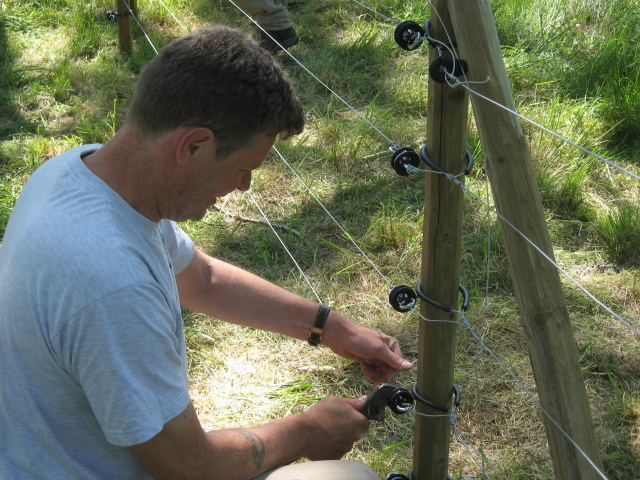 -Courses on site and in the field to build and maintain fences. -Network of volunteers that respond immediately in case of predatorattacks and build temporary fences, assisting with new fences and maintaining existing ones. -Assisting and advicing farmers to apply for compensation for fencing and predatordamages. -Information how to avoid predatordamage at livestockherding in alpinemeadows (Fäbodsbruk). -Protectionmethods for driving huntingdogs and adaptations. -Examples of these methods in an international perspective. -Meeting with Saarlooswolfdogs to get an impression of the exterior characteristics of a wolf, experiencing the hands-on contact, exterior-, behavioral differences and similarities between a Saarlooswolfdog and a wolf. -Lectures and presentations at schools, companies and organisations. -Moose and wild boar will be held on the facility to be able to visualize the range of preyspecies. -Sheep will be held behind wolfdeterring fences. -Cooperation is regarded as a very important tool. We are aiming to cooperate with all the relevant research- and other organisations, as well as with expert private persons. An expanded international network of specialists already exists. We want to finance our activities with entries from admissionfees, sponsors, cafe and shopactivities, educationfees, admission for exhibitions, lectures, presentations, excursions, lodgings, roomrentals and projectsubsidies. Only for the start-up fase extra financing is needed. Meaning is to obtain a suitable farm in the area which has te potential to offer all of the above mentioned possibilities. vargiväst. Thema Eenvoudig. Mogelijk gemaakt door Blogger.